What is Early Case Assessment? Early case assessment is an initial, general inquiry of custodians and their data for the purpose of narrowing and defining scope. This practice can be repeated and will occur at multiple points in the EDRM. While conducting early case assessment, you will gain an understanding of document quantity to inform cost expectations, and document quality to inform your understanding of scope and relevance in preparation for the 26(f) conference. To get the full analytics on your collected data, all or most of that data must be processed in your eDiscovery tool. Many eDiscovery vendors charge 50-80% of costs up front in the processing stage. Because of this overwhelming cost, most attorneys in the past have ignored early case assessment altogether and made risky decisions to over-exclude documents before processing them or even looking at them. This over-exclusion of data is high risk – higher likelihood of sanctions. On the flip side, over-inclusion of documents has been expensive which stems from an outdated eDiscovery pricing model of overcharging up front for processing fees. Early case assessment fundamentally relies on the initial over-inclusion of data in the EDRM stages of identification, preservation, collection, processing and your “quick look” review. In the identification stage – (that is identifying possible sources of relevant data), there tends to be low certainty of which sources will reveal documents that have the highest probative value for your case. Because of this uncertainty, it is a best practice to over-preserve because it will reduce risk and educate you more about your client. 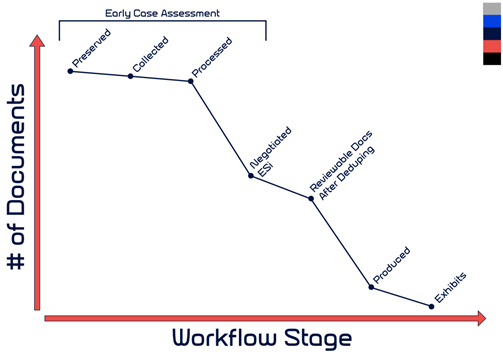 The following graphic outlines the trimming of documents as you move through the eDiscovery workflow. In particular, notice that most of the data that is preserved should also be collected and processed. Only once you have your data in the eDiscovery platform will you be able to use simple early case assessment tools and strategies to holistically understand you data at a high level. After this “quick look review”, you should be prepared to negotiate the scope of your matter with the goal of significantly reducing the amount of potentially relevant ESI. Tip: Process all your collected data in Digital WarRoom to get hard numbers. You’ll be more knowledgeable about the data and you can use this information to negotiate. Digital WarRoom charges no processing fees, and you only pay $1-$10 per GB per month based on the maximum amount of data that you hosted in the tool at any point within that month. There is no standard timeline for how quickly you should complete early case assessment, but as you define your scope and trim data from month to month, your eDiscovery bill decreases. Since Digital WarRoom hosted subscriptions are charged per GB, the quantity and size of documents will be the best indicators of your hosted discovery costs. There will be opportunities in speaking with your client and custodians to get an initial read on data volume. Common questions that you should be considering may be; Are there a couple email boxes that could be relevant? Do we have the time or budget to review an entire department worth of corporate emails with twelve desktops? You will need to make a ballpark estimate. Although these estimates may be marginally useful to start preparing for litigation, you should not go into your 26 (f) conference without understanding the hard numbers. For example: the client may not know that their one email box holds 100,000 emails that were never deleted over 20 years. As part of your “quick review”, get an idea of data volume and use that information to inform initial cost expectations. First, go into the reports view and mark down (export) the volume of data in the entire database as well as the number of documents. Take a look at each of these metrics within each collection. Given this data volume, consider the size/expertise of your review team and come up with some quick estimates for how long it might take for your review team to review all these documents – 1 month? 3 months? 10 months? What would be the cost of attorney review hours? What would be the eDiscovery vendor costs? Use the Digital WarRoom cost calculator and get a quote from your vendor to generate your own cost estimate range which you can use to manage client expectations. Carefully consider if the cost and burden of eDiscovery proportional to the monetary amount or contemplated damages in question (FRCP 26.b.1). As you collect all this information, consider the benefits and costs of reducing scope thereby reducing data volume. Are you worried they are hiding something? Are you worried that your review team will become overwhelmed by the amount of ESI? 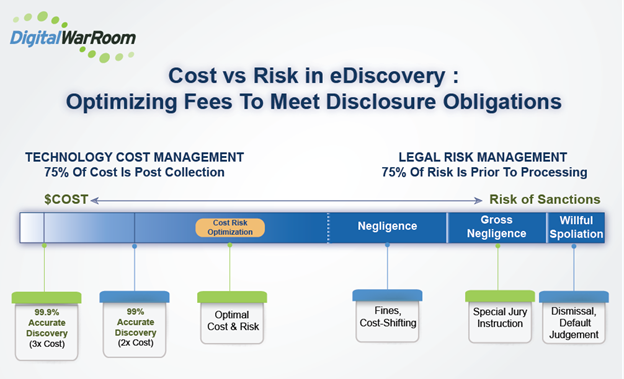 Is your client willing to accept the costs and risks involved with your approach to eDiscovery? Scope and relevancy of discovery will be the topic of discussion in your 26(f) conference. This discussion is crucial to your eDiscovery efforts as well as managing client fee expectations. In order to prepare for this argument, you will need to know your data. Rule number one of the FRCP states that eDiscovery should come to a just, speedy and inexpensive resolution. In short, eDiscovery should not be weaponized by piling documents onto your opponent, nor should you be subject to weapons of costly eDiscovery. If you are knowledgeable about the collected data, you will be well equipped to defensibly negotiate scope – thereby significantly reducing the attorney review hours, data hosting costs and quantity of reviewable ESI. Here is an overview of an example early case assessment plan that accounts for both cost management (limiting hosting fees) and risk management (completing requirements to avoid sanctions). Litigation is a risk management, cost management and time management practice. You are managing these three things at all points in your litigation. Low risk? Produce faster. Limited time? Cut corners by bulk marking. Facts not supporting your claim or counterclaim? Settle or find other ways to save time and money. Limited budget? Make defensible but higher risk assumptions about your data to reduce scope. The following graph outlines the constant tug and pull between managing costs and minimizing risk. If you do nothing – that is spend no money and no time (let’s be honest- time is money), you will sit at the far right of the chart. The far right represents 100% risk and zero costs. If litigation becomes imminent, the first action you should take is to issue a legal hold on documents that could be relevant in eDiscovery. This is preservation. If you do not preserve your client’s documents, you leave yourself open to the risk of willful spoliation. If your client destroys their documents, you could be sanctioned and lose the case on a default judgement. In every case, you have to spend a certain amount of money and time to meet disclosure obligations. At the same time, you should not go over the top on spending in a way that would bankrupt your client. Here are some examples of actions that will move you left along the chart to meet and hopefully go beyond your disclosure obligations. When conducting eDiscovery, the “obligation” is that attorneys must ensure clients produce all responsive documents. However, the enormous amount of data in today’s age has caused courts to relax certain rules on sanctions for an inadvertently produced document. For example, attorneys can now have a clawback provision built into the 26 (f) agreement which allows either side to clawback a document which was inadvertently produced. Document reviewers are not expected to be 100% accurate. A perfect review with 99.9% accuracy might be consume three times the attorney hours and therefore three times the cost of compliance. In a “bet the company” kind of case, each party may decide that the stakes and risk are so high that the trial should be won at all costs. In a landmark case like Apple vs Samsung, one of the parties may decide to do a double review. This option is expensive. The intention of a double review would be to prevent errors in every way possible. In our experience involving many 1,000s of matters since 2002, most firms are not willing to win at all costs, but rather look to find a balanced strategy that aims for both minimizing cost and minimizing risk. Regardless of the amount of money spent on attorney review hours, there is always risk. If you push a production out the door quickly, the risk of potential errors may be high. The risk begins to join with the supervising attorney who is in charge of making sure all reviewers understand the context of which documents are privileged, responsive, etc. The best way to manage risk is to be prepared for litigation with a well thought-out discovery plan. If your firm chooses to insource eDiscovery with Digital WarRoom, we will assist you in creating a standard, repeatable eDiscovery process over several months of training and experience with Digital WarRoom. We cannot emphasize enough the importance of the 26 f in achieving cooperation between parties. At a basic level, the conference is a chance to go over initial disclosure 26(a)(1), discuss possibility of a settlement, discuss practical details and most importantly discuss your eDiscovery plan. Your tactics for negotiating ESI should correspond directly with filtering options in the Digital WarRoom policy wizard. This dialogue will prompt you to apply filters and trim your data before moving into document review. 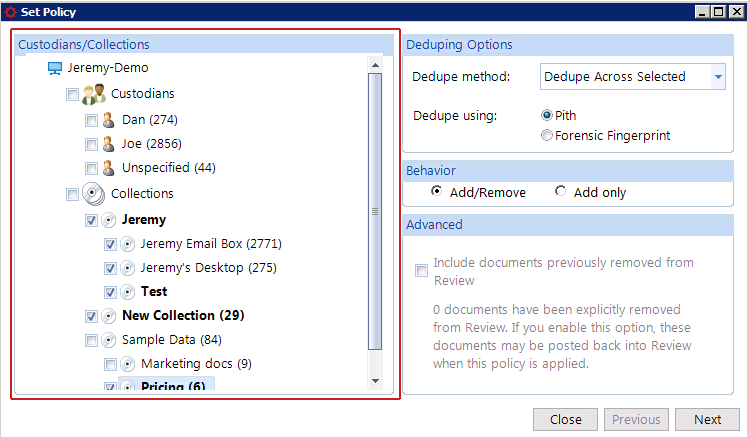 Here are some examples of applying a negotiated filter in the policy wizard. Filter based on the negotiated potentially relevant time frame. For example, from the date of an incident to the present. Create a keyword list and only return documents that hit on words in the negotiated keyword list. 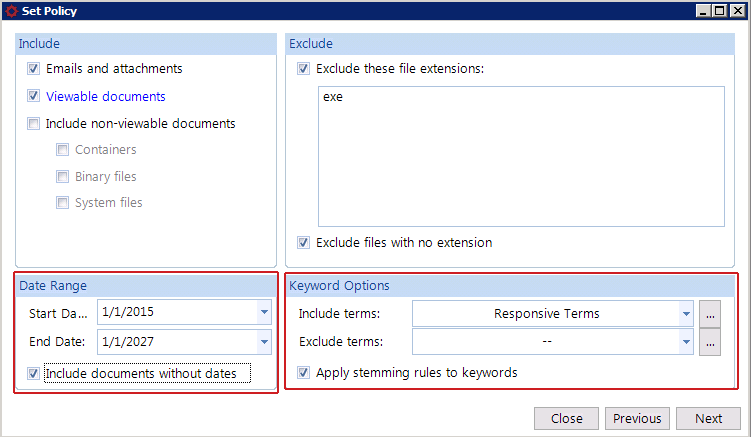 For example – negotiate a keyword list called “Responsive Terms”. Hopefully by now you have taken a moment to consider your firm's needs and risk tolerance. 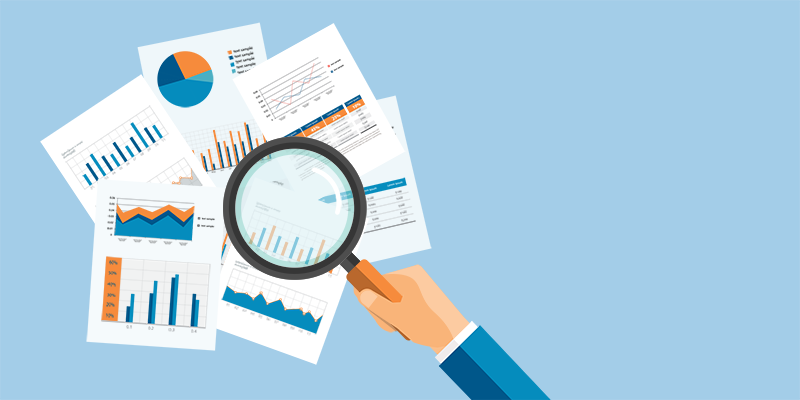 As you develop a long term relationship with your eDiscovery vendor, you will find yourself one step ahead when it comes to creating a discovery plan and finding patterns in your data during your quick review. At Digital WarRoom, we support the goal of reducing the scope of ESI in early case assessment. The advantages are clear. Justice - preventing the weaponization of eDiscovery. Speed - less review hours leading to a faster resolution. Affordability- saving your client from an unreasonably large eDiscovery bill.